*It was a slow news week here at NERW Central, and it seems to have been a slow news week overall in MASSACHUSETTS, too - at least judging by the amount of attention devoted to the "revelation" that WBZ (1030 Boston)'s veteran morning news anchor does his broadcasting from his vacation home in Florida several weeks a year. 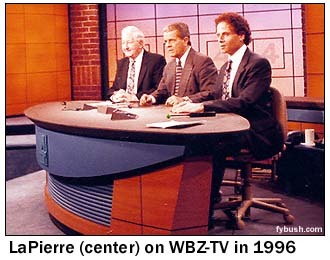 By way of disclaimer, it's no secret at all that your editor's resume includes a stint (1992-97) at WBZ, much of that time as Gary LaPierre's morning news writer - but LaPierre's Florida remotes were hardly a secret to anyone in the Boston broadcasting community. To the Boston Globe, though (and longtime readers of this column know just what we think of that paper's coverage of the broadcast scene), the discovery that some of LaPierre's broadcasts were coming from St. Augustine was worthy of a long story, complete with quotes from the "journalism ethics experts" whose numbers must still have been in the Globe Rolodex from the days of Patricia Smith and Mike Barnicle. We won't pretend to be unbiased about the station and the anchor from whom your editor learned most everything he knows about writing for radio news. That said, we also don't see what all the fuss is about. After four decades of covering the news in Boston, Gary LaPierre understands the city and its inhabitants as well as anyone in local radio or TV, and that doesn't change just because he's sitting in his condo in Florida instead of the studio in Boston. Thanks to modern digital technology, his Florida home studio has precisely the same access to information (the AP news wire, audio from the CBS and ABC radio networks and from WBZ-TV, the newsroom computer system and its internal text messaging capability and, most vitally, the audio and text generated by WBZ's own Boston-based reporters in the studio and in the field) that he'd have in Boston. When your editor worked at WBZ, the studios (only one of which even had an outside window, we'd note) were down a twisty corridor from the (windowless) newsroom, and most of the contact between anchor and newsroom was via computer or intercom anyway - so, in effect, the only difference is that the "corridor" is now a thousand miles long instead of a hundred feet. In today's radio environment, there's nothing at all unusual about broadcasting from a remote or home studio. WBZ's own David Brudnoy has been doing it for years, ever since his illness made it impossible for him to return to the air nightly from the station. Across town, WTKK (96.9) afternoon talk host Jay Severin does his show most days from his home in Sag Harbor, Long Island. And big names such as Rick Dees, Paul Harvey, Don Imus and Rush Limbaugh all broadcast from their homes, often several time zones from their main studios, for much of the year. Yes, there's a difference in that Gary LaPierre is a news anchor and not a talk host, DJ or commentator - but we'd contend that his job, too, can be performed remotely and is not dependent on being chained to his studio. What he - and any good anchor - does is to synthesize the information that's coming in from the front-line gatherers of news. It's vital that the men and women who are out there reporting should truly be in the field locally; you can't claim to be a local news operation any other way. But an anchor who's already familiar with the community - and with four decades of reporting and anchoring under his belt, nobody meets that description better than Gary LaPierre - should be able to do that job from just about anywhere, at least on occasion, with the help of the many tools today's technology provides. In a nutshell: Unless there's a breaking news event taking place in the small corner of the parking lot outside the WBZ studio window, there's nothing Gary LaPierre can offer his listeners from Boston that he can't offer them equally well from Florida. And while the Globe "scoop" provided plenty of fodder for the usual band of talking heads to expound in print and in forums like WGBH's "Greater Boston," we suspect WBZ's listeners aren't going to turn their dials elsewhere just because the voice they've been listening to all these years sometimes comes from sunny Florida. The audience isn't stupid - it knows when it's getting something that's local (no matter where the anchor may happen to be sitting) and when it isn't. That said, we still have two concerns. First, in a business where accuracy and integrity are everything - and WBZ's concern for Gary LaPierre's integrity can be measured by the station's longstanding refusal to allow him to do "live-read" commercials - it was probably a bad idea to avoid any mention of his whereabouts on the air or in other media. We agree with WBZ program director (and our former boss) Peter Casey that there's no compelling reason to clutter the already crowded formatics by mentioning LaPierre's location in each half-hour's news open, or even on a daily basis. But a well-placed feature story two years ago about how technology made it possible for WBZ to keep their popular morning anchor on the air and serving Boston listeners would have forestalled the inevitable "gotcha" story that was bound to show up in the absence of a more timely disclosure. WBZ had nothing to be ashamed of, and still doesn't. Our second concern goes beyond WBZ itself, to the use of this technology for less constructive purposes. While WBZ's mission of providing local news continues to be maintained by the large staff toiling behind the mikes and behind the scenes in Boston, many other stations are using cheap ISDN and satellite connections to avoid spending the money to generate news and public affairs content locally. Whether it's Sinclair's "News Central" operation, which every night offers the spectacle of a "Rochester" (or "Pittsburgh," or "Flint" or "Las Vegas") newscast that's anchored in large part from Maryland, including a "local" weather segment in which the forecaster has never even seen the market on which she's reporting, or a "local" talk show being done on the cheap by a host hundreds of miles away with no connection to the market in which he's being heard, there are already too many examples of remote broadcasting being done to the detriment, instead of to the advantage, of local audiences. It's a shame to see someone with the experience and, yes, the integrity of Gary LaPierre being tarred with that same brush. *Up in NEW HAMPSHIRE, the ever-growing Nassau Broadcasting is adding yet another set of stations to its nascent New England cluster, as it picks up oldies WNNH (99.1 Henniker), oldies WLKZ (104.9 Wolfeboro) and hot AC WHOB (106.3 Nashua) from Tele-Media, which bows out of New England with the sale. No purchase price has been announced yet; the Tele-Media stations join the clusters Nassau is buying in Maine from Mariner and the WMTW Broadcast Group. From Concord, Harry Kozlowski checks in with an update on the construction of WCNH-LP (94.7), the new classical music station that's getting ready to sign on up there. 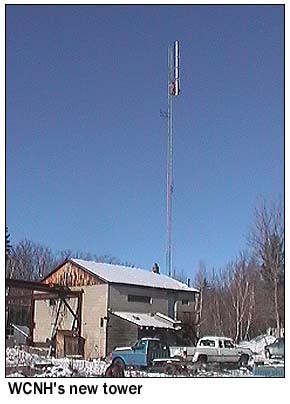 Harry sent along this picture of the 2-bay Shively antenna that the folks from Prescott Tower in Vermont rigged up over the weekend at the station's site on Little Pond Road; he says transmitter tests will get underway as early as the middle of this week, with the formal sign-on coming in February. *One CONNECTICUT note: Samantha Stevens exits middays at WKCI (101.3 Hamden); she's looking for a new gig via her site at www.samanthastevens.net. *Here in NEW YORK, we took a snowy drive over to WGMC (90.1 Greece) last Wednesday afternoon to see and hear the sign-on of the community jazz station's new 15 kW directional signal. The station is definitely getting out much better than it did on its old 2050-watt signal, but we're still plagued by an amazing amount of intermodulation from nearby Pinnacle Hill at our NERW Central listening post, alas. In the Finger Lakes, CSN International briefly had their new Geneva translator W216BR (91.1) on the air last month, but interference complaints from Syracuse's WCNY (91.3) and Ithaca's WSQG (90.9) quickly got it pulled from the air. CSN has now applied to move the translator to 90.7, where we suspect it would still cause interference to WSQG and to Rochester's WBER (90.5). We hear there are some changes coming - perhaps as soon as this week - as George Kimble and his crew take over at WFLR (1570/95.9) in Dundee. Look for the AM side to join the "Finger Lakes News Network" already heard on WGVA (1240 Geneva), WCGR (1550 Canandaigua), WSFW (1110 Seneca Falls) and WAUB (1590 Auburn) - and we hear the FM side will flip from AC to country when the sale closes. In Syracuse, Abbie Weber is leaving her duties as midday jock and PD of "K-Rock" (WKRL 100.9 North Syracuse/WKRH 106.5 Minetto/WKLL 94.9 Frankfort-Utica) to take a job in sales at Galaxy; corporate VP/programming Mimi Griswold will handle acting PD duties while looking for a replacement. And Kevin Kline, aka "F'n Kevin," has moved from nights to mornings at K-Rock, replacing "Silent Bob" Staffa. There's a PD opening in Albany, too - Donnie Michaels is heading south, leaving behind his gig (including PM drive) at WFLY (92.3 Troy) to take over the APD/midday shift at "Y100" WHYI (100.7 Fort Lauderdale-Miami). WWLE (1170 Cornwall-on-Hudson) is another station looking to increase its power - it's asking the FCC for permission to move to 1150, where it would go from an 800-watt daytimer to 2500 watts day, 500 watts at night. Up on the edge of Lake Champlain, WIPS (1250 Ticonderoga) is changing hands: Patricia Knapp's "BisiBlue, LLC" is acquiring the little community station from Empire State Radio for $93,000. In New York City, ABC's WEPN (1050) has a new program director - Mike Thompson, former producer of WABC's "Curtis and Lisa" show and former sports PD in Los Angeles, Atlanta and Dallas - and a new local early-morning show, as Don Lagreca launches "First Sports" from 5-6 AM starting today. Out on Long Island's East End, the inevitable callsign shuffle is taking place at the Morey Organization's three FMs: WBON (107.1 Hampton Bays) has taken the WLIR-FM calls from 92.7 (now WZAA); WDRE (98.5 Westhampton) has finally become WBON, matching its "Bone" rock format; and WXXP (105.3 Calverton-Roanoke) takes the WDRE calls. *In southern NEW JERSEY, WSNJ (1240 Bridgeton) is getting a new owner. Quinn Broadcasting, which already owns WMVB (1440) in nearby Millville, will pay Ed Bold's estate $550,000 for the AM station and the studio-transmitter facility that's long been home to 1240 and its sister station, WSNJ-FM (107.7). And while the FM station will have a completely new sound in a few months when its sale to Ed Seeger's American Media Services closes (and it's then moved to 107.9 in Pennsauken and spun to Radio One to serve Philadelphia), Quinn's owner, Millville mayor Jim Quinn, says the AM facility will keep the hyper-local programming that's long distinguished WSNJ. Quinn says some WSNJ programming will be simulcast on WMVB, and he plans to add a Webcast as well. *Forever Broadcasting finished reworking its station lineup in Altoona, PENNSYLVANIA early last week, returning a well-known set of calls to the airwaves in the process. After several days of stunting on what had been classic hits "Majic" WMAJ-FM (104.9 Hollidaysburg), the station relaunched as "Rocky 104.9," playing some newer rock along with the old, and applying for new calls WRKY - the same calls that spent many years on co-owned 103.5 over in Steubenville, Ohio, before it became "Froggy" WOGH. The new 770 signal near Pittsburgh has new calls, as WKTW disappears from Jeanette to be replaced by WKFB, matching sister station WKHB (620 Irwin). Over in Philadelphia, oldies WOGL (98.1) has shuffled its lineup: Harvey Holiday moves from nights to a long 9 AM-3 PM shift (partially tracked, we wonder? ), bumping Christy Springfield (formerly 9-noon) to weekends and Mike St. John (noon-3) out of the station completely. Bob Charger moves from weekends to nights. Some good news from Oldies 98: morning guy Don Cannon will be back on the air January 26 as he recovers from heart surgery. A few tidbits from Milkman UnLimited, too - former Toronto morning host Donna Saker (CKFM, Q107) and London/Peterborough veteran Griff Henderson (who also worked with Saker at CKFM) are the new morning show at CIEZ (Classic Hits FM 96.5) in Halifax, replacing John Harada and Kelli Rickard. And Rob Mise adds "CHR/Top 40 Format Captain" for parent company NewCap Broadcasting to his OM duties at Ottawa's "Hot 88.9" (CIHT). *That's it for another week...except for a few housekeeping issues. First, a reminder that while we don't ask you for a password to read NERW, this isn't a free product, either. Many of you have already sent in subscription payments for 2004, and to all of you we say "thank you." If you haven't, what are you waiting for? Your contribution - of any amount - makes it possible for us to keep NERW, now in its tenth year, coming to you week after week after week...and if you sign up at the $60 level, you even get a free 2004 Tower Site Calendar. For all the details - and easy credit card/PayPal payment links - just click here. If you haven't seen it yet, don't miss our roundup of all the news that was fit to remember from last year... Click here for our 2003 Year in Review package! *And if you still haven't ordered one, we have plenty of 2004 Tower Site Calendars still available for your enjoyment! Just as in past years, the calendar features a dozen spiffy 8.5-by-11 inch full-color images of tower sites from across the nation - everything from Washington's WTEM to New York's WCBS/WFAN (shown at left) to Los Angeles' KHJ to WCTM in Eaton, Ohio. Other featured sites include Cedar Hill in Dallas, Lookout Mountain above Denver, CKLW Windsor, WELI New Haven, WPTF Raleigh NC, WBT Charlotte NC, WAJR Morgantown WV, WMT Cedar Rapids IA and the mighty 12 towers of KFXR (the old KLIF 1190) in Dallas. Unlike last year, this year's calendar features heavier paper (no more curling!) and will be shipped shrink-wrapped on a cardboard backing to make sure it arrives in pristine condition. If you haven't ordered yet, what are you waiting for? It's too late for Christmas gift-giving - but perhaps you still need a calendar for 2004...or maybe you didn't find one under the tree, despite all those hints you dropped. NorthEast Radio Watch is made possible by the generous contributions of our regular readers. If you enjoy NERW, please click here to learn how you can help make continued publication possible. NERW is copyright 2003 by Scott Fybush.